POWDERMIX LP-3550 is a Medium Density Linear Polyethylene Resin (LMDPE) in powder, additivated with antioxidants and UV stabilizers. It is suitable for Rotational Molding applications. Items produced by POWDERMIX LP-3550 have a good balance between mechanical properties, flexibility and ESCR resistance. LP-3550 is produced in: natural, black. Due to its combination of mechanical properties, ESCR resistance and fluidity, POWDERMIX LP-3550 is suggested for the production of medium capacity containers and hardly shaped items, wine barrels, playgrounds, road barriers. It is NOT the right material for playground slides, solid waste tubes, small boats. Grades colored Black & Natural are Food Approved. Typical Values refer to the base resin (natural). Values are typical, depending from the lot of base resin production. Values refer to an injection molded plaque of 4 mm thickness. Values may differ in rotomolding production. POWDERMIX LP-3560 is a Medium Density Linear Polyethylene Resin (LMDPE) in powder, additivated with antioxidants and UV stabilizers. It is suitable for Rotational Molding applications. Items produced by POWDERMIX LP-3560 have a good balance between mechanical properties, flexibility and ESCR resistance. LP-3560 is produced in: natural, black. Upon request in terracotta. Due to its combination of mechanical properties, ESCR resistance and fluidity, POWDERMIX LP-3560 is suggested for the production of medium capacity containers and hardly shaped items, wine barrels, playgrounds, road barriers. It is NOT the right material for playground slides, solid waste tubes, small boats. Grades colored Black, Terracotta & Natural, are Food Approved. POWDERMIX LP-3642 is a Medium Density Linear Polyethylene Resin (LMDPE) in powder, additivated with antioxidants and UV stabilizers. It is suitable for Rotational Molding applications. Items produced by POWDERMIX LP-3642 have a good balance between mechanical properties and ESCR resistance. LP-3642 is produced in: natural, black. Upon request in terracotta, fire red, yellow. Due to its combination of mechanical properties, ESCR resistance and fluidity, POWDERMIX LP-3642 is suggested for the production of medium capacity containers and hardly shaped items, wine barrels, playgrounds, road barriers. It is NOT the right material for playground slides, solid waste tubes, small boats. Grades colored Black, Teracotta & Natural, are Food Approved. POWDERMIX LP-4135 is a Medium Density Linear Polyethylene Resin (LMDPE) in powder, additivated with antioxidants and UV stabilizers. It is suitable for Rotational Molding applications. Items produced by POWDERMIX LP-4135 show good mechanical properties and high ESCR resistance. LP-4135 is produced in: natural, black. Upon request in fire red, yellow. Due to its combination of good mechanical properties, high ESCR resistance and fluidity, POWDERMIX LP-4135 is suggested for the production of high capacity containers and hardly shaped items, playground slides, solid waste tubes, small boats, canoes. Grades colored black & natural, are Food Approved. POWDERMIX LP-3940 is a Low Density Linear Polyethylene Resin (LLDPE) in powder, additivated with antioxidants and UV stabilizers. It is suitable for Rotational Molding applications. Items produced by POWDERMIX LP-3940 have a very good balance between mechanical properties and ESCR resistance. LP-3940 is produced in: natural, black. Upon request in terracotta, fire red, yellow, blue. Due to its combination of mechanical properties, ESCR resistance and fluidity, POWDERMIX LP-3940 is suggested for the production of medium capacity containers and hardly shaped items, wine barrels, playgrounds, road barriers. It is NOT the right material for playground slides, solid waste tubes, small boats. Grades colored Black, Terracotta & Natural, are Food Approved. Typical Values refer to the base resin (natural). Values are typical, depending from the lot of base resin production. Values refer to an injection molded plaque of 4 mm thickness. Values may differ in rotomolding production. Median Granulometry is 50 mesh (350 microns) which goals more than 15% economy on process time. 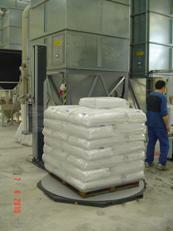 POWDERMIX SYRMOS S.A.i.c. is your reliable partner in Rotational Molding.